Good ideas are like baby birds. They poke their way into the world in fits and starts, feathers in disarray. But in time, they take flight. That’s how it’s been watching our tool for viewing oil and mining contracts emerge, waddle and take off over the past five years. Even when the law requires corporations and governments to disclose the deals they make in the “extractive industries,” the contracts that set the terms can remain hard to find and even harder to understand. As internet director for Revenue Watch Institute (now NRGI), and as strategy consultant to the Open Contracting Partnership and other allies, I’ve had a front row seat—and a few hours of game time—in the struggle to make these contracts literally and conceptually accessible. The Resource Contracts site was conceived in 2011. 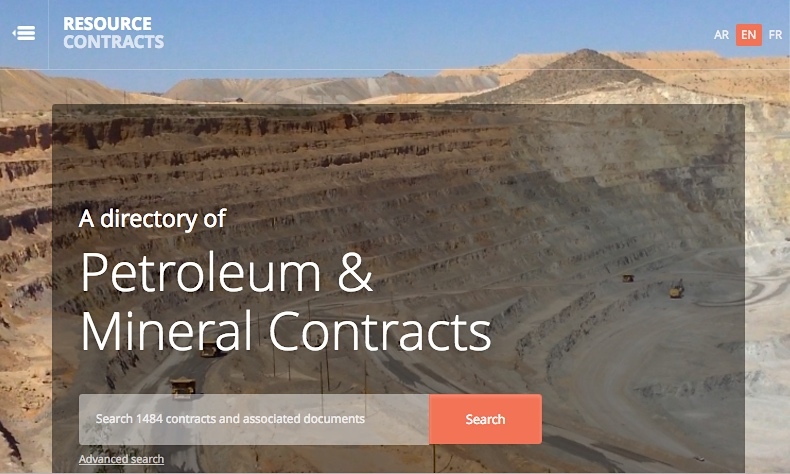 It grew out of Revenue Watch’s ongoing pursuit of transparency in oil and mining deals and conversations with our legal experts about how technology could unlock the complexity and inaccessibility of long contracts in hard-to-view PDFs. Amanda Hickman (now of BuzzFeed) first told us about the DocumentCloud tool, which lets sites post and annotate PDFs for readers without forcing them to download. 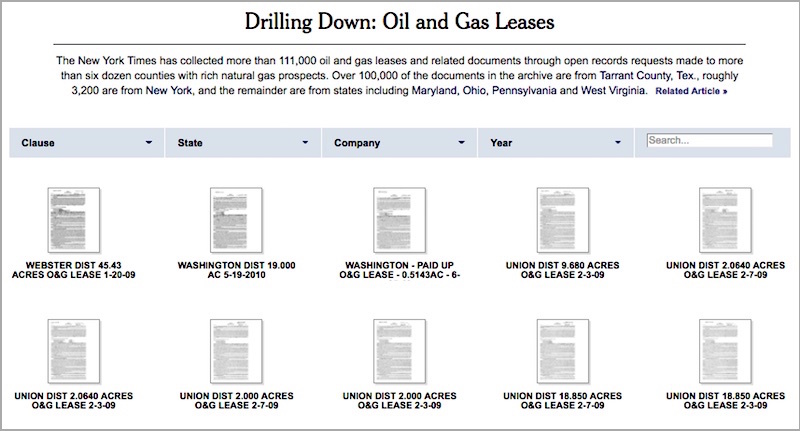 The idea for the tool clicked into place when I saw how NYTimes.com displayed oil leases in a series on natural gas deals in the western United States. Using the same Document Cloud tool, we worked with Mapbox, Columbia University and support from The World Bank to launch the fledgling site in winter 2012-13. Since then, the tool has helped the nation of Guinea to review its biggest mining contracts, provided a foundation for greater contract transparency in the Philippines and Sierra Leone, and given birth to a sister site, Open Land Contracts, led by the legal experts and researchers at the Columbia Center for Sustainable Investment. We continue to rethink and upgrade the toolset that runs ResourceContracts.org. Last week, my colleagues from NRGI and CCSI and I announced the newest improvement: a suite of features to help governments and advocates compare different sections of different contracts, in order to find trends, scrutinize deals and make informed recommendations as new deals are forged. Below is an excerpt from our explanation of this new “Clipping” tool. The “UX” is by no means perfect, but I’m really proud of the progress we’ve made and of the work of several smart, patient colleagues at NRGI, at Columbia and at Young Innovations, the Nepalese programmers coding the newest version of our tool. Almost one third of the 1,450 contracts on ResourceContracts, an online repository of publically available investment contracts, feature annotations that provide plain language summaries of each contract’s key environmental, social, fiscal and operational provisions. … Want to compare contracts quickly and easily? Try using the ResourceContracts Clips tool. This new feature lets you select and compare annotations from one or more documents in ResourceContracts, view them side by side, or save or print them to compare offline. This blog sets out some useful information about how governments, advocates and others can use this new tool. What can Clips be used for? Clips is a useful tool for users seeking to understand and compare different contracts. Specifically, it can help users with the following tasks and research questions. Comparisons across countries: For instance, how do provisions on royalties compare across national jurisdictions? Comparisons for one company operating in different countries: For instance, what is the income tax rate paid by a company in different jurisdictions? To view all your Clips, click on the blue View Clips button to go to the All Clips page. On the All Clips page you can compare, sort, share, download or print the selected Clips. To remove all saved Clips, click Clear All Clips (located towards the top left of the page, below the search panel). Read our full description of new Resource Contracts features here.